﻿We are an outreach ministry of the Shueyville United Methodist Church in Shueyville, Iowa. We will represent Jesus Christ by living, teaching, and sharing the Christian faith and way of life. We define quality care and education as structured programs with many and varied learning enrichment opportunities, all rooted in Christian beliefs. 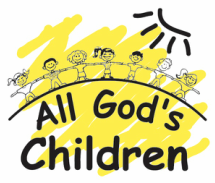 The goal of All God's Children is to help children develop positive feelings about God, themselves, others and learning. We believe AGC should be a place of security, a time of fun, and exposure to new learning possibilities. Opportunities for social, emotional, physical, intellectual and spiritual growth will be provided throughout the year. We will strive to develop a partnership with parents that will nurture a positive relationship between our program and families. We're halfway between Iowa City and Cedar Rapids, just off I-380 - about a mile east off Exit #10. They are accepting new members! See their website for Sunday worship times and the list of other exciting ministries SUMC has to offer. We get to talk about Jesus! A time of fun and a place to play!